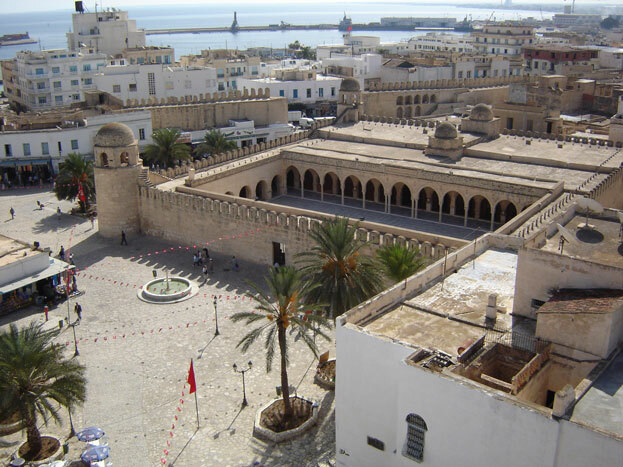 Medina of Sousse bears exceptional witness to the civilization of the first centuries of the Hegira. The medina constitutes an early and interesting example of a new type of Islamic city. 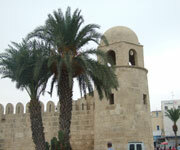 The most ancient and best conserved of all, the ribat of Sousse is an excellent example of this type of construction. The port of Sousse was the Phoenician outpost of Hadrumetum, a free Roman city, the capital of Byzacium under Diocletian, the Vandal city of Hunericopolis, and finally the Byzantine city of Justiniana or Justinianopolis. No monument, however, survives from these thousand years of history, for during his conquest of Ifriqiya, Oqba ibn Nafìi entirely destroyed Justinianopolis after a two-month siege. Built in the late 7th century on these ruins and given its present name, Sousse was a completely new city. The most ancient monument still standing, the Ribat, belongs to that period. It was part of the Islamic defences against the Byzantine fleets. The ribats housed the garrisons of the Defenders of the Faith, the Mourabitin, and their austere architecture reflected the structures' dual military/religious function. In 821 the Emir Ziyadat Allah I completed the fortifications by adding a square bastion with tower which served both as a watchtower and as a minaret. From the enclosed port, protected by these walls, Muslim troops embarked in 827 on their conquest of Sicily. Under the Aghlabids (800-909), Sousse rapidly flourished. Certain significant monuments were constructed in this golden century: the mosque of Bu Ftata, the first kasbah, and the Great Mosque, founded by the Emir Abdul Abbas Mohammed. In 859, the urban walls seem to have been in their final stage of completion, and the limits of the medina were broadly drawn. The surrounding fortifications made the military function of the ribat less vital and it reverted fully to its religious function. The port declined with the founding of Mahdia in 916, but re-established itself in the 11th century. In the 12th century its status was again compromised when the Sicilian Normans captured Sousse and held it for eleven years. The Spanish troops of Charles V took Mahdia in 1554; after this it recovered to some extent. The medina was conceived according to a regular plan with its meridian axis running from Bab el Khabli to the ribat and the ancient interior port, and its east-west axis going from Bab el Djedid to Bab el Gharbi. It is a rectangular enclosure flanked with towers and turrets, a single gate on the south, an inner courtyard rising over two levels with 35 cells opening on to it. It has a mosque on the southern side of the first storey with the south-east tower, added in 821, serving as both minaret and watchtower; from it signals could be transmitted to the ribat at Monastir. Browse All UNESCO World Heritage Sites in Tunisia. The original UNESCO inscription Here!! !